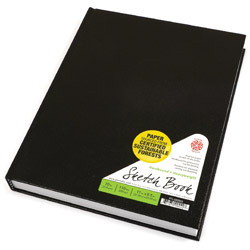 Traditional Wirebound Sketchbook has 160 pages (80 sheets) of 70 lb. (114 gsm) acid free sketch paper. Sturdy and elegant front and back covers with leatherette texture keep your artwork and notes intact while providing a firm handheld drawing surface. Sheets are micro-perforated for easy removal. Double wire bound strength for effortless 360 degree page turning. Thick gauge, coated wires will not easily collapse. Paper sourced from certified sustainable forests. Excellent for sketching, classwork and writing. Traditional Hardbound Sketchbook is a stylish, perfect-bound library quality book, but with blank pages for your imagination to fill! Artwork-filled volumes stand conveniently upright on a bookshelf. 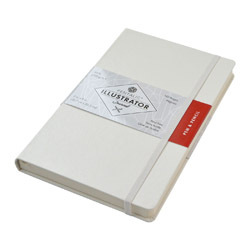 Flush and sturdy binding protects artwork and keeps pages from sliding, for minimized smearing. The spine is designed for lay-flat drawing. Books contain 220 pages (110 sheets) of bright white 70 lb. acid free drawing paper. Cover has an embossed leatherette texture. Excellent for sketching, classwork and writing. Watercolor Field Book has 24 sheets of acid free 140 lb. (300 gsm) cold pressed watercolor paper. Sturdy and elegant front and back covers with lightly stippled texture keep your artwork intact while providing a firm handheld drawing surface. Double wire bound strength for effortless 360 degree page turning. Thick gauge, coated wires will not easily collapse. Paper sourced from certified sustainable forests. Books are side bound for landscape format. Paint or draw across each two-page spread to capture expansive panoramic scenes. Acid-free, cream colored, 60 lb. (100gsm) smooth surface paper is excellent for use with pencil, pen and ink, fine line or micron markers, ballpoint pens, and technical pens. Each hand made hardbound book has 192 pages, an elastic closure, a ribbon marker and a pocket in the back. Signatures are sewn in, and books will lay flat so the artist can draw across the page. 8" x 5" available in 3 colours: Mocha (brown), Espresso (black) and White Chocolate. European milled, 140 lb. 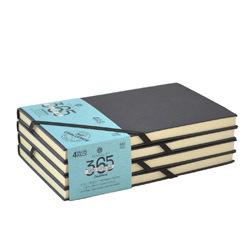 (300 gsm) acid free paper provides the perfect weight and texture for watercolor journaling. 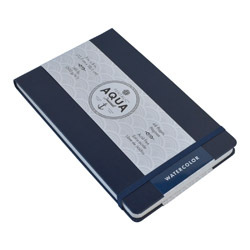 Each Aqua Journal is bound with six signatures so that the book lays flat when open. An elastic brush holder is positioned at the top of the book and is designed to hold a standard travel brush (sold separately). The Aqua Journal is fitted with our signature ribbon marker, elastic band closure and storage pocket in the back of the book. The midnight blue cover material is manufactured in Europe. 24 sheets / 48 pages. Available in 4 sizes. Wherever you go, capture life as it happens with this art journal designed to fit anywhere. 160 pages of acid-free, slightly toothy, recycled 74 lb (120 gsm) bright white sketch paper is perfect for sketching, notes and field work. 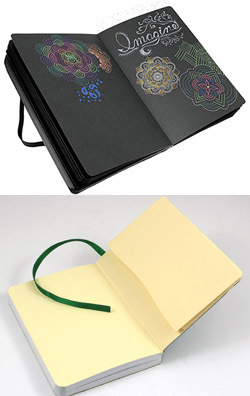 Includes an elastic closure, ribbon marker, back page pocket and flexible, water-resistant Italian made cover. Available with white pages or black pages. 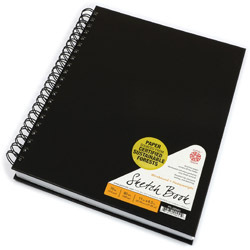 Black paper is perfect for use with gel, glitter and metallic pens and markers. Small in size, big in scope. 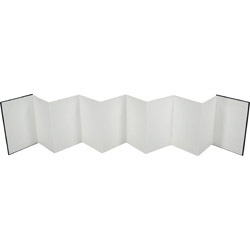 10 panels allow the artist to create individual sketches or one long panoramic one. Expands from 4" x 6" to 6" x 40". Available in sketch and watercolor varieties. Sketch version is made with acid free, 104 lb. paper, perfect for all dry media as well as pen and ink. Watercolor version is made with acid free, 140 lb. cold press surface paper, perfect for watercolor as well as pen and ink. The perfect sketchbook for artists on the go. Join the fill a sketchbook a month revolution! One of the greatest achievements of social media is the ability for growing artists to share their work. Artist communities all over Facebook and Instagram are supporting one another through positive feedback and constructive criticism. This is why Pentalic created the @pentalic365 Instagram. With this account they challenge Pentalic artists to create art every day. No matter their skill level, and whether they have an hour to paint or ten minutes to sketch, the challenge is simply to pick up their sketchbook once a day. They post suggested prompts monthly and publicly showcase the art from those participating in the challenge. All you have to do is share your work with the world using the hashtag #pentalic365. Value pack features: Customizable hardbound cover, 67 lb. 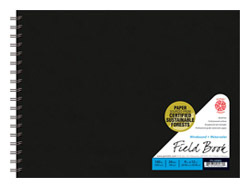 (100 g/m2) smooth surface acid free, ivory colored paper, perfect for pen and dry media, economical value pack allows artist to sketch freely at a low cost, elastic corner closer keeps book intact during transport, 160 micro-perforated pages per book, 4 books per value pack, 640 total pages.